All plaques include a stock plate, appreciation plaques include a stock plate with a thank you message. Custom Engraving can be added to any order with a plate, custom layouts for plaques and engraving are available, please call. Free shipping for plaques still applies for case quantities, additional plaques not in a case quantities will be assessed a shipping fee. 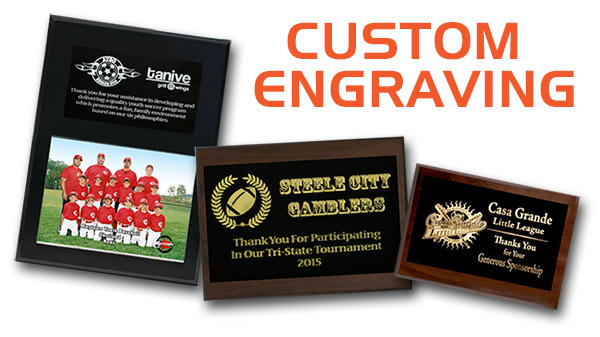 -All custom engraving requires a 4 day lead time. *Ask for a quote on extra large plates. LOGO Engraving: We can engrave logos, however, art must be black and white. We can also convert color art to black and white if necessary at a per hour retouching charge. LASER engraving only. -Logos from your black and white artwork $25.00 "Art Set-Up" charge on first time orders with that particular logo. Repeats incur no "Art Set-Up" charge (Standard $5.00 per invoice set-up charge still applies). -If artwork requires retouching, $40 per hour rate applies. Estimate will be provided.